To monitor the ECMO experience, an ECMO registry was established in 1980 at the University of Michigan. Dr. John Toomasain in 1984 created the Neonatal ECMO Registry. In 1989, charter for Extracoporeal Life Support Organization (ELSO) was formed with the purpose of stimulating multi-institutional research in the field of acute lung injury and its therapy. During the next two decades, the largest case series experience was registered by the ELSO voluntary case reporting registry. 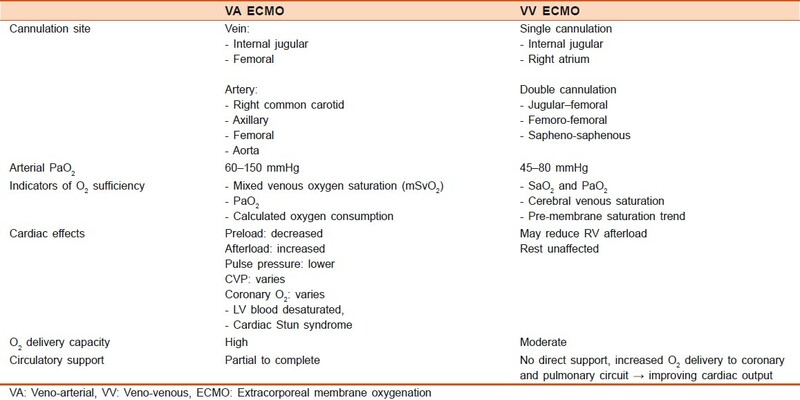 ECMO today is an accepted treatment modality for neonatal, pediatric and adult patients with respiratory and/or cardiac failure, failing to respond to maximal medical therapy or following heart surgery when there is an inability to wean from cardiopulmonary bypass or as a bridge to definitive therapy [Table 2]. The components include [Figure 1] a roller or impeller pump, a membrane oxygenator, a heat exchanger, polyvinylchloride connecting tubing, connectors and a bladder reservoir. Blood is driven through the membrane by the roller pump or centrifugal pump and passively drained by gravity from the venous circulation using a siphon height of 100 cm or more into a collapsible bladder that acts as a compliant reservoir. The bladder has a proximity switch attached to its surface and acts to regulate the roller pump by turning it off when the bladder deflates. The roller pump or centrifugal pump draws blood from the bladder and pushes it through silicone membrane oxygenator and then a heat exchanger before returning it to the patient. The bladder and pump are linked by a trip-switch mechanism so that if pump flow exceeds venous drainage, the bladder collapses to inhibit pump flow. This blood flow in the extracorporeal circuit requires systemic heparin administration to prevent thrombus formation within the circuit and membrane oxygenator. Heparin is required after arterial and venous cannulation, 100 IU/kg bolus followed by infusion of 125 IU/kg/hour to maintain an ACT at 180-200 s. Titration of appropriate anticoagulation with its antecedent clinical implications of bleeding and thrombosis remains the principal causes of mortality and morbidity. The vast differences in neonatal and adult anticoagulation and transfusion requirements demand tremendous clinical knowledge to provide the best care. Methods to recognize the level of thrombin formation at the bedside could help reduce thrombotic neurologic complications. ECMO requires an overall multidisciplinary team approach to achieve the best clinical outcome. Circuits for ECMO support can be broadly categorized into two types [Table 4]: veno-arterial (VA) and veno-venous (VV) ECMO. Depending on the sole need to provide respiratory support to an additional cardiovascular support, it can be interchanged from VV to VA or veno-arterial-venous (VAV) ECMO. On ECMO support, blood flow is essentially nonpulsatile and the perfusion is reflected by the narrow pulse contour and the narrow pulse pressure. Blood flow during ECMO is maintained at 80% of the calculated total blood flow and the accepted pulse pressure is between 10 and 15 mmHg. When on total ECMO support, i.e. 100% of calculated flow, the left ventricle (LV) gradually distends from Thebesian return and ejects, leading to an occasional pulsatile beat; therefore, it cannot be sustained for long with normal cardiac function, necessitating the ECMO flows being reduced to 80% of total calculated flow. Pulse contour is therefore not physiologically important for gas exchange as long as the total blood flow is adequate. VA ECMO offloads and provides rest to right side of the heart. In patients with impaired LV function, distension even from Thebesian shunt flows can lead to subendocardial hypoperfusion. In veno-venous (VV) ECMO, a double lumen venous cannula is used to remove blood from the right atrium (RA), which is then oxygenated and returned back to the RA through the distal lumen of the double lumen cannula [Figure 2]. VV ECMO does not support the circulation and hence no effects on hemodynamics are seen, as blood withdrawn from the RA is returned back into the RA. Since CO 2 is readily diffusible, relatively low VV flow is sufficient to remove CO 2 . In VV ECMO, the mixed venous oxygen saturation is high. The oxygenation is blood flow dependent and more blood must pass through the oxygenator to achieve a good degree of oxygenation. Clinically, maintaining a hematocrit of >5% above normal on VV bypass helps to improve oxygenation [Table 6], [Table 7], [Table 8] and [Table 9]. This type of ECMO is suitable when adequate cardiac output reserve is present to compensate for hypoxia with the systemic O 2 delivery being just adequate enough to meet the systemic oxygen requirement. VV ECMO increases oxygen flow to the pulmonary artery (PA), the increased blood flow increases pulmonary vascular resistance and increases RV afterload which may precipitate right ventricular myocardial stun. With pre-existing pulmonary hypertension, management strategies are directed against right ventricular afterload increase. The effects of higher oxygen saturation in the PA may decrease pulmonary vascular resistance and right ventricular afterload, along with avoidance of increased LV afterload, thereby improving coronary artery perfusion and LV performance. Three variables are used to monitor oxygenation during VV ECMO: 1) arterial oxygen saturation (SaO 2 ); 2) mixed venous oxygen saturation(mSvO 2 ); and 3) preoxygenator O 2 saturation. SaO 2 is simple and readily available with easy interpretation. Preoxygenator O 2 saturation (determining factor for adequate oxygenation in VA ECMO) is interpreted on lines of mixed venous saturation because of recirculation. [Table 10] shows the factors affecting recirculation with the use of double lumen cannula. High SaO 2 values may be present despite the drop in mSvO 2 and O 2 delivery. An SaO 2 value <70% reflects suboptimal O 2 delivery. mSvO 2 taken from jugular bulb is not affected by recirculation and is not sensitive to cardiopulmonary status, but is sensitive to ventilation changes secondary to preserved cerebral blood flow even in situations of cardiopulmonary failure. It provides systemic perfusion as in VA ECMO (heart and lung support), and is done in VV ECMO with the addition of an arterial cannula. This transformation from VV to veno-arterial-venous (VAV) is initiated on hemodynamically unstable patients for providing cardiac support [Table 11]. During the VAV ECMO run, there should be no persistent acidosis or base deficit and the lactate levels should be normal, similar to patients managed on VA ECMO. By increasing blood flow, lower oxygen saturations or arterial gases can be accepted, if the perfusion parameters are acceptable. Studies suggest that drug administration distal to the reservoir may be optimal, but this site increases the risk of air embolism. Thus, many ECMO centers choose to administer drugs proximal to the reservoir, allowing the top of the venous reservoir to serve as an air trap. Principally removes CO 2 with some oxygenation of the blood done without any mechanical pump support. The flow rate (25-29% of cardiac output) is much lower than ECMO and is dictated by the arterial-to-venous pressure difference of the patient and the hydraulic resistance of the artificial lung. Maximum CO 2 removal was approximately 100 ml/min or 96% of total CO 2 production. IVOX™, developed by Mortensen and colleagues at Cardio Pulmonics, Inc. (Salt Lake City, UT), is the only intravascular artificial lung that has undergone human clinical trials. Placed in the vena cava, it provides respiratory support at 40-60% of the basal metabolic needs. Innovative prototypes of intravascular lung assist device (ILAD) were developed at Northwestern University, capable of O 2 and CO 2 transfer at 40-70 ml/min (20-30% of the body's resting metabolic needs). To enhance gas exchange, an active or dynamic (D-ILAD) form was devised, with rotation of the entire device increasing the blood convection across the fiber surfaces. This improved gas transfer performance, while providing some pumping motion to blood flow, accomplished O 2 and CO 2 transfer rates of 208 ml/min/m 2 and 310 ml/min/m 2 , respectively, in bovine models. Another design requiring placement through the right ventricle into the PA was developed at Penn State University as PENSIL, for Penn State Intravascular Lung. Placement within the PA maximized gas exchange. It achieved reasonable O 2 exchange efficiencies at 140 ml/min/m 2 and CO 2 exchange (corrected to a blood PCO 2 driving force of 50 mmHg) was low, however, at only 25 ml/min/m 2 . Intravascular artificial lung under research at the McGowan Institute for Regenerative Medicine in University of Pittsburgh is known as the Hattler Catheter, which was formally referred to as the intravenous membrane oxygenator (IMO). CO 2 removal rate achieved with the respiratory Hattler catheter tested balloon pulsation increased gas exchange by 200-300% at the lowest blood flow rate compared to 50-100% enhancement at the highest blood flow rate without balloon. a) In-series configuration connects proximal PA, diverting all the cardiac output through the device and returning it to the distal PA immediately upstream of the natural lungs used as an effective embolic filter. The mechanical load on the right heart increases as it provides the pumping energy for both the natural and the artificial lung. An estimated 0.11 W/(l/min) is the power used by the right ventricle. b) In-parallel configuration connects the PA and the left atrium, with only a fraction of the blood flow getting diverted. Here, the advantage is reduced right heart workload, but the disadvantage is that only a fraction of total cardiac output receives respiratory support and this fraction is not exposed to the metabolic and filtering functions of the natural lung. The power requirement of the in-parallel configuration (assuming two-thirds of total flow through the Total artificial lungs and one third through the natural lung) is roughly half that for the in-series configuration. c) The hybrid configuration attaches the inlet of the artificial lung to the proximal PA and uses a split return to the distal PA (and natural lung) and to the left atrium. This allows all the cardiac output to flow through the artificial lung with less resistance than the in-series configuration and also allows greater flow through the natural lung than the in-parallel configuration. The power requirement of the right heart for this configuration depends on the amount of blood flow through the artificial lung relative to the natural lung, and is approximately 0.08 W/(l/min). Patients with a weak or failing right ventricle would require either the in-parallel or hybrid configurations because of the reduced power required for adequate perfusion of the artificial lung and natural lung. Chronic artificial lung (CAL): Development is under the University of Maryland for chronic lung support. As a bridge-to-transplant device, it achieves 21-day support of basal metabolic needs using rapidly rotating disk made of microporous hollow fiber membranes. The motor controller directing centrifugal disk rotation can generate pulsatile or nonpulsatile flow (reduce the impact on the right heart with its intended in-series attachment mode). The CAL generated 5 l/min flow against a 100 mmHg pressure head at 1600 rpm during steady-flow bench tests in animal models. Integrated heart-lung assist device (IHLAD) combines the functions of a blood pump and artificial lung into one device with the goal of providing emergency percutaneous cardiopulmonary support. The IHLAD incorporates a central six-vane impeller driven by a magnetic coupling to an outer motor and is surrounded by gas-exchanging hollow fiber membranes. The blood-contacting surfaces are treated with covalently bonded heparin to reduce thrombogenicity and allow preprimed storage for emergency use. Evolution is the nature's norm, so has been this arena with the human endeavors trying to mimic it. For ECMO, engineering and the medical fraternity had a long and consistent association in achieving this present feat and the future endeavor continues for replicating this natural physiologic system as close as possible. 1. Bartlett RH, Gazzaniga AB, Jefferies MR, Huxtable RF, Haiduc NJ, Fong SW. Extracorporeal membrane oxygenation (ECMO) cardiopulmonary support in infancy. Trans Am Soc Artif Intern Organs 1976;22:80-93. 2. Kolobow T, Bowman RL. Construction and evaluation of an alveolar membrane artificial heart lung. Trans Am Soc Artif Intern Organs 1963:9;238-43. 3. Wetterberg T, Steen S. Total extracorporeal lung assist: a new clinical approach. Intensive Care Med 1991;17:73-7. 4. Wolfson PJ. 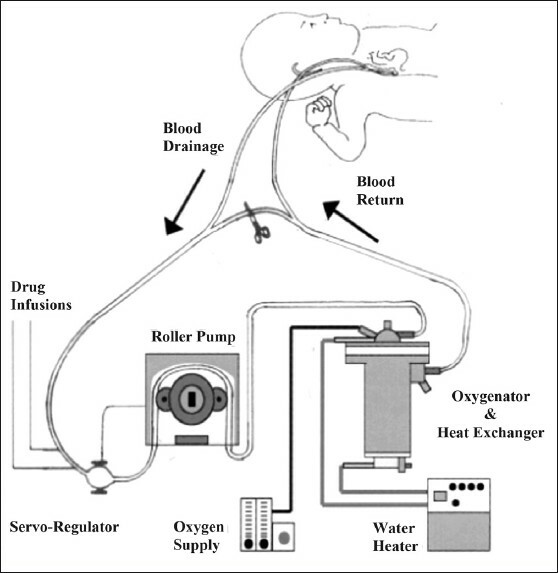 The development and use of extracorporeal membrane oxygenation in neonates. Ann Thorac Surg 2003;76:S2224-9. 5. Bartlett RH. Esperanza. Presidential address. Trans Am Soc Artif Intern Organs 1985;31:723-6. 6. Alpard SK, Zwischenberger JB. Extracorporeal membrane oxygenation for severe respiratory failure. Chest Surg Clin N Am 2002;12:355-78. 7. Peek GJ, Sanowski AW. Extra-corporeal membrane oxygenation for paediatric respiratory failure. Br Med Bull 1997;53:745-56. 8. Holley DG, Short BL, Karr SS, Martin GR. Mechanisms of change in cardiac performance in infants undergoing extracorporeal membrane oxygenation. Crit Care Med 1994;22:1865-70. 9. Martin GR, Short BL. Doppler echocardiographic evaluation of cardiac performance in infants on prolonged extracorporeal membrane oxygenation. Am J Cardiol 1988;62:929-34. 10. Tanke R, Daniels O, Van Heijst A, Van Lier H, Festen C. The influence of ductal left-to-right shunting during extracorporeal membrane oxygenation. J Pediatr Surg 2002;37:1165-8. 11. van Heijst AF, van der Staak FH, Hopman JC, Tanke RB, Sengers RC, Liem KD. Ductus arteriosus with left-to-right shunt during venoarterial extracorporeal membrane oxygenation: effects on cerebral oxygenation and hemodynamics. Pediatr Crit Care Med 2003;4:94-9. 12. Meliones JN, Moler FW, Custer JR, Snyder SJ, Dekeon MK, Donn SM, et al. Haemodynamic instability after initiation of extracorporeal membrane oxygenation: role of ionized calcium. Crit Care Med 1991;19:1247-51. 13. Martin GR, Short BL, Abbott C, O'Brien AM. Cardiac stun in infants undergoing extracorporeal membrane oxygenation. J Thorac Cardiovasc Surg 1991:101:607-11. 14. Terragni PP, Birocco A, Faggiano C, Ranieri VM. Extracorporeal CO 2 removal. Contrib Nephrol 2010;165:185-96. 15. Pesenti A, Zanella A, Patroniti N. Extracorporeal gas exchange. Curr Opin Crit Care 2009;15:52-8. 16. Kolobow T, Gattinoni L, Tomlinson TA, Pierce JE. Control of artificial breathing using an extracorporeal membrane lung. Anesthesiology 1977;46:138-41. 17. Pettignano R, Labuz M, Gauthier TW, Huckaby J, Clark RH. The use of cephalad cannulae to monitor jugular venous oxygen content during extracorporeal membrane oxygenation. Crit Care 1997;1:95-9. 18. Clowes GH Jr, Hopkins AL, Neville WE. An artificial lung dependent upon diffusion of oxygen and carbon dioxide through plastic membranes. J Thorac Surg 1956;32:630-7. 19. von Segesser LK, Tkebuchava T, Marty B, Leskosek B, Tevaearai H. Intravascular gas transfer. Membrane surface area and sweeping gas flows are of prime importance. ASAIO J 1997;43:M457-9. 20. Kolobow T, Bowman RL. Construction and evaluation of an alveolar membrane artificial heart-lung. Trans Am Soc Artif Intern Organs 1963;9:238-43. 21. Buck ML. Pharmacokinetic changes during extracorporeal membrane oxygenation: implications for drug therapy of neonates. Clin Pharmacokinet 2003;42:403-17. 22. Noerr B. ECMO and pharmacotherapy. Neonatal Netw 1996;15:23-31. 23. Southgate WM, DiPiro JT, Robertson AF. Pharmacokinetics of gentamicin in neonates on extracorporeal membrane oxygenation. Antimicrob Agents Chemother 1989;33:817-9. 24. Mulla H, Pooboni S. Population pharmacokinetics of vancomycin in patients receiving extracorporeal membrane oxygenation. Br J Clin Pharmacol 2005;60:265-75. 25. Spriet I, Annaert P, Meersseman P, Hermans G, Meersseman W, Verbesselt R, et al. Pharmacokinetics of caspofungin and voriconazole in critically ill patients during extracorporeal membrane oxygenation. J Antimicrob Chemother 2009;63:767-70. 26. Formica F, Avalli L, Colagrande L, Ferro O, Greco G, Maggioni E, et al. Extracorporeal membrane oxygenation to support adult patients with cardiac failure: predictive factors of 30-day mortality. Interact Cardiovasc Thorac Surg 2010;10:721-6. 27. Kumar TK, Zurakowski D, Dalton H, Talwar S, Allard-Picou A, Duebener LF, et al. Extracorporeal membrane oxygenation in post cardiotomy patients: Factors influencing outcome. J Thorac Cardiovasc Surg 2010;140:330-6.e2. 28. Wagner K, Risnes I, Abdelnoor M, Karlsen HM, Svennevig JL. Is it possible to predict outcome in pulmonary ECMO? Analysis of pre-operative risk factors. 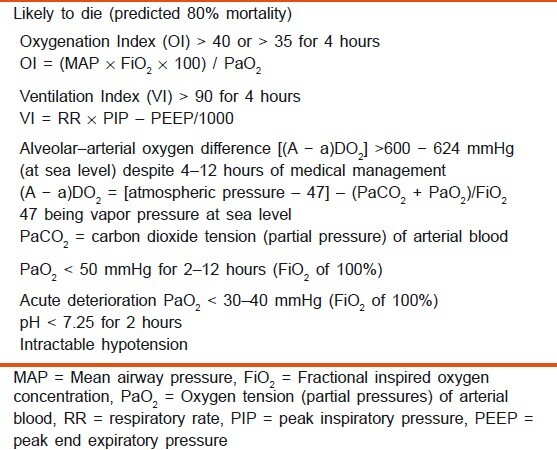 Perfusion 2008;23:95-9. 29. van Vidmar, Janez Primosæ, Gorazd Kalan, Mefan Grosek. Extracorporeal membranous oxygenation (ECMO) in neonates and children experiences of a multidisciplinary paediatric intensive care unit. Signa Vitae 2008;3(Suppl1):S17-21. 30. Walters HL, Hakimi M, Rice MD, Lyons JM, Whittlesey GC, Klein MD. Pediatric cardiac surgical ECMO: multivariate analysis of risk factors for hospital death. Ann Thorac Surg 1995;60:329-7. 31. Kolovos NS, Bratton SL, Moler FW, Bove EL, Ohye RG, Bartlett RH, et al. Outcome of pediatric patients treated with extracorporeal life support after cardiac surgery. Ann Thorac Surg 2003;76:1435-41. 32. Sachweh JS, Tiete AR, Fuchs A, Römer U, Kozlik-Feldmann R, Reichart B, et al. Efficacy of extracorporeal membrane oxygenation in a congenital heart surgery program. Clin Res Cardiol 2007;96:204-10. 33. McHugh LG, Milberg JA, Whitcomb ME, Schoene RB, Maunder RJ, Hudson LD. Recovery of function in survivors of the acute respiratory distress syndrome. Am J Respir Crit Care Med 1994;150:90-4. 34. Musthafa AA, Angus DC, Linde-Zwirble WT, Clermont G, Griffin M. The first year after ARDS: Results of a multi-center study. Crit Care Med 1999;27:A37. 35. Schelling G, Stoll C, Haller M, Briegel J, Manert W, Hummel T, et al. Health-related quality of life and posttraumatic stress disorder in survivors of the acute respiratory distress syndrome. Crit Care Med 1998;26:651-9. 36. Hopkins RO, Weaver LK, Pope D, Orme JF, Bigler ED, Larson-LOHR V. Neuropsychological sequelae and impaired health status in survivors of severe acute respiratory distress syndrome. Am J Respir Crit Care Med 1999;160:50-6. 37. Stoll C, Haller M, Briegel J, Meier M, Manert W, Hummel T, et al. Health-related quality of life. Long term survival in patients with ARDS following extracorporeal membrane oxygenation (ECMO). Anaesthesist 1998;47:24-9. 38. Zwischenberger JB, Lynch JE. Will CESAR answer the adult ECMO debate? Lancet 2009;374:1307-8. 39. Conrad SA, Rycus PT, Dalton H. Extracorporeal Life Support Registry Report 2004. ASAIO J 2005;51:4-10. 40. Brunston RL Jr, Zwischenberger JB, Tao W, Cardenas VJ Jr, Traber DL, Bidani A. Total arteriovenous CO 2 removal: Simplifying extracorporeal support for respiratory failure. Ann Thorac Surg 1997;64:1599-604. 41. Snider MT, High KM, Richard RB, Panol G, Campbell EA, Service CV, et al. Small intrapulmonary artery lung prototypes: design, construction, and in vitro water testing. ASAIO J 1994;40:M533-9. 42. Monzyk BF, Burckle EC, Carleton LM, Busch J, Dasse KA, Martin PM, et al. Photolytically driven generation of dissolved oxygen and increased oxyhaemoglobin in whole blood. ASAIO J 2006;52:456-66.